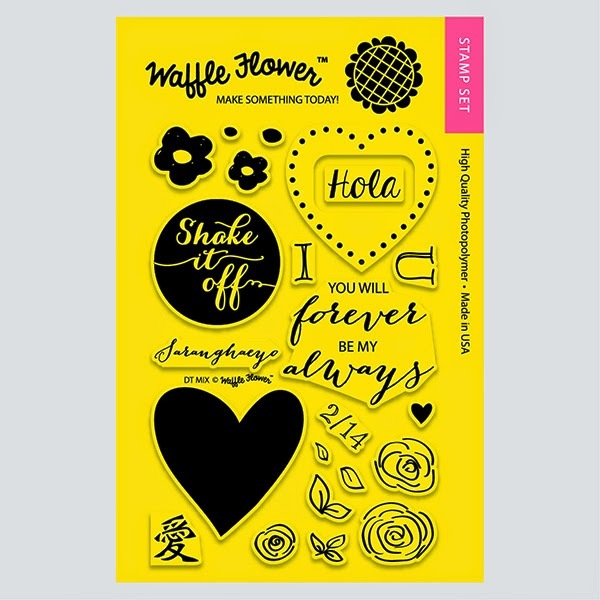 Hello Everyone, many of you knew that I step down my position as a DT at Waffle Flower Crafts due to family issues. But before that happened, Nina asked us to design something special for the upcoming DT Mix stamp set. For this wonderful opportunity I designed this simple flowers/leaves images for the set. I have created a simple but you can do many things with it, like watercolor it, you can color it with Copics really its up to you :). 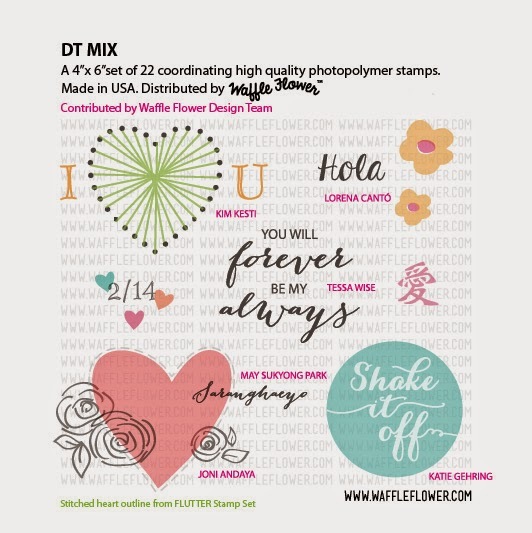 The whole entire DT Mix stamp set if full of possibilities I am sure you will love. For my first project I created a Mom card. First stamped the flowers and leaves on a white cardstock and colored it with Copics. Next, I fussy cut then adhered on the triangle foil patterned paper from MME and adhere it with white cardstock panel. Next, I add a ribbon from Maya road and adhered the flower panel on the kraft card base. Then I stamped the sentiment "Saranghaeyo" means I love you and then added the "mom" sentiment from the past released Be My Guest stamp set. To begin my second card I first stamped the flowers & leaves all over the card then colored it with Copics, then used the Copics Colorless Blender to create the faux watercolor effect. Next I added some Stickles for sparkle and shine. Next, I added some dots using the past released Starry Night stamp set. 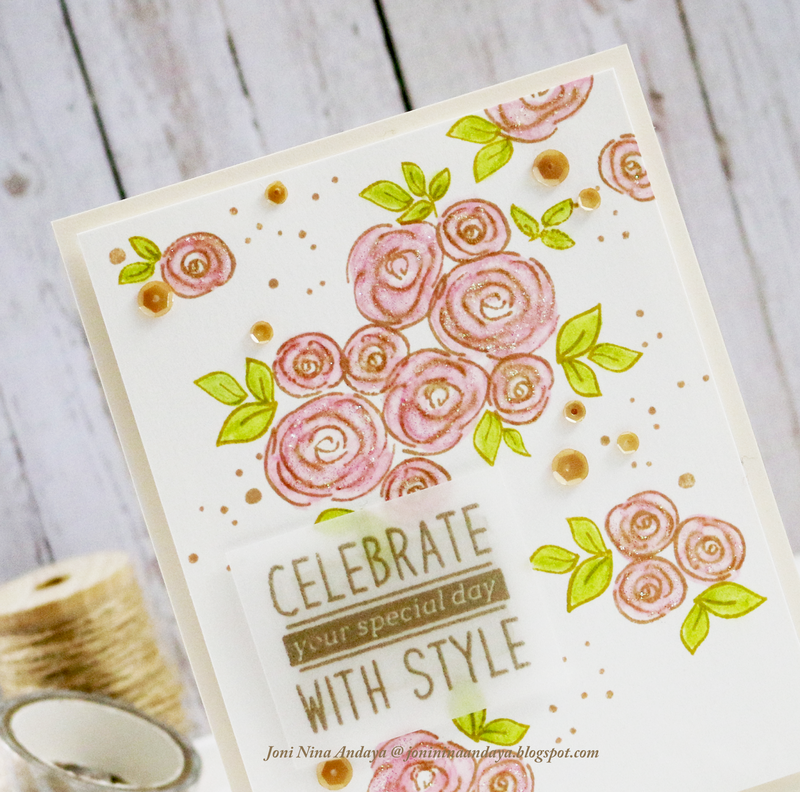 For the sentiment "Celebrate your special day with style" from Bowtiful stamp set was stamped on the vellum and gold embossed. Then adhered on the panel using the clear foam tape from 3M. To finish off the card I added some Sand sequins 4mm and 6mm from Pretty Pink Posh. Joni Andaya......... you are here! We have a stamp set of choice as a prize for this hop! The random winner will be drawn from comments left on all of our blogs! Enter by 11:59pm Eastern on Thursday, Jan 8. The winner will be announced at Waffle Flower Crafts Blog on Jan 9. We are also hosting giveaways on Instagram and Facebook, head over there for more prizes! These are simply gorgeous! LOVING the flowers!!!!! Both your cards are gorgeous Joni ..I love this design you have created for the stamps ..the flower and leaves combo is so pretty !!! Happy New Year! I hope you enjoyed a wonderful holiday season!! Love your gorgeous cards. They are always so stunning! Love the craft, black and pink combo! These are beautiful, Joni! Love what you designed! I love the cards. The flowers have enough detail to be so pretty but don't over-power the other aspects of the card. The gold on the vellum is beautiful. I finally tried heat-embossing vellum and love the look. What a great idea having a DT mix. So many different and fun stamps in one set. This set is top of my list. 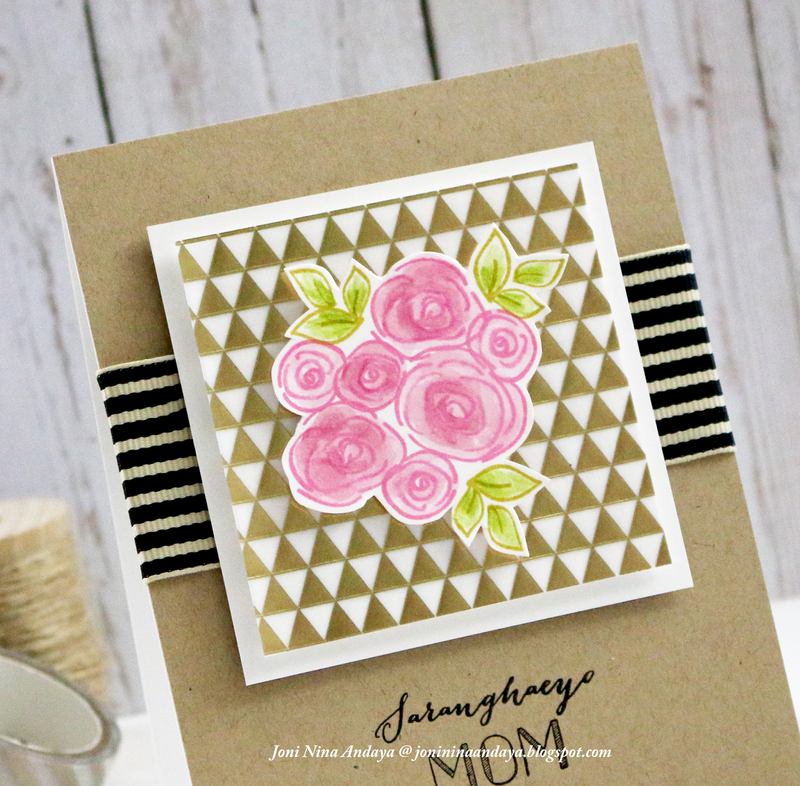 Great work on those beautiful cards Joni. Joni, I love all your creations. Definitely you are a inspirations for us. Thanks for sharing this fantastic cards. Your cards are so lovely! I especially love the sparkling rose card. Hey Joni! Both of your cards are great, but my favorite is the first one! Job well done!! LOVE the simple flower contribution you made to the set! Joni, these are both beautiful cards. The one for "Mom" is so special. Great job with the design. Happy New Year! Gorgeous cards!! The sentiments are perfect with the fabulous flowers !!! Wow I love how different this stamp set is. Both cards are beautiful but my favorite is the vellum with the sand sequins. Thanks for sharing your talent with us. I hope that everything turns out well for you and your family. I love the pretty little flowers you designed for the set Joni!! Both cards are super pretty! Love the flowers! I'm always a sucker for them! Gorgeous stamp and card! Keep up the illustrations, I love them! You did an amazing job of creating with the beautiful flowers!! Each card you made was a pleasure to look at with its beautiful colors and awesome designs!! SO excited about this release!!! CONGRATULATIONS on your contribution to the DT mix Joni!!! LOVE your flowers & leaves and I LOVE the cards you created with them - they're DELIGHTFUL!!! Gorgeous cards. What a wonderful stamp set to have contributions from the design team - really makes it special! fabulous card with a touch of gold! Great job on both the stamps and the cards. TFS. They're both terrific, but the second one is my fav! Your contribution is so elegant and pretty!!! I love them all! You guys always come up with fresh and beautiful stuff! Thanks for sharing your beautiful cards. I love those flowers. Love both your cards! They are gorgeous! Thanks for your inspiration and sharing! Hope everything turns well for you and your family soon! Lovely cards! Thank you for sharing.....and the color combos are great! Gorgeous Joni!! Love those flowers! Joni, this is so perfect to cheer you mom. This flower image is my type of bouquet! LOVE it! These are gorgeous! The triangular paper...love the soft flowers against it! I love your bouquet card with triangle foil and craft paper! I love the glitter on your flowers, it's just the perfect touch!! I love you mixed the gold with those pretty pink flowers. This is so beautiful! 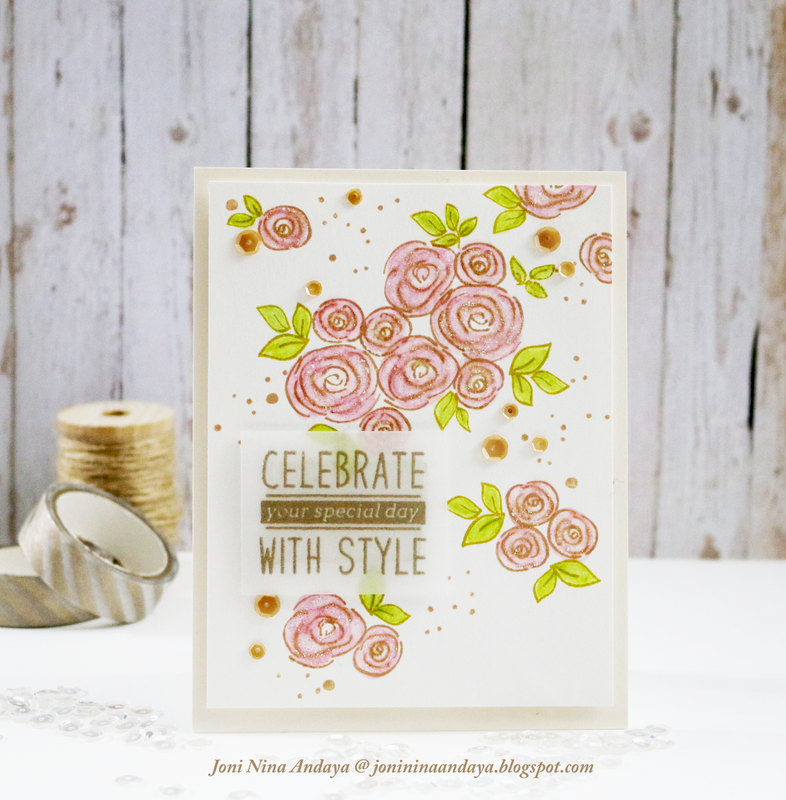 Love the gold foil behind the pretty flowers!